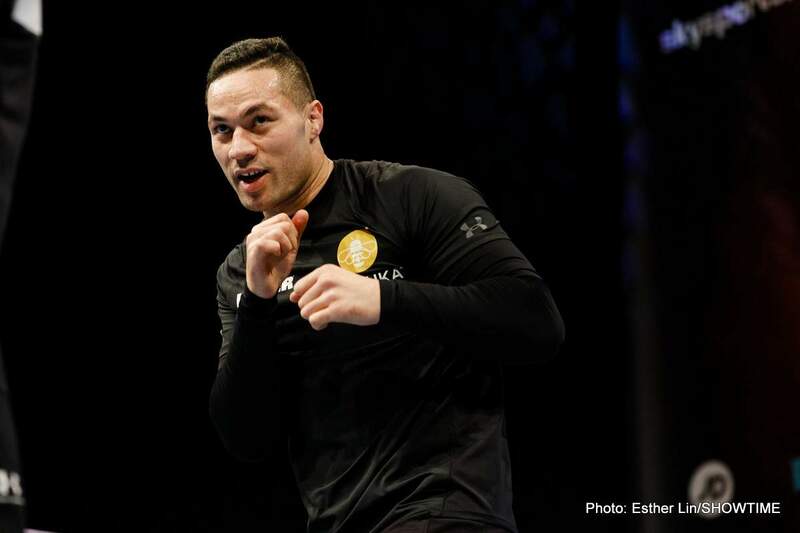 Former WBO heavyweight champ Joseph Parker has not scored a KO or stoppage since back in October of 2016, when he stopped Alexander Dimitrenko in the third-round. This KO drought will come to an end this Saturday night at the sold-out O2 in London, Parker predicts – as he will KO Dillian Whyte in their high-stakes heavyweight elimination bout. There will be much on the line in Saturday’s fight, even the very careers of the two men, at high level status anyway. And Parker, 24-1(18) has vowed to put on an “explosive performance” and take out the once-beaten Whyte quicker than Anthony Joshua managed it. Whyte gave a pre-world champion AJ a rough and tough rumble, but he was eventually stopped in dramatic fashion in the seventh-round. Can Parker – who has been extended the full 12-rounds in his last three wins and who was outpointed over 12 in his loss to Joshua – really get Whyte out of there inside seven-rounds? Ask most experts and fans and they will tell you Parker-Whyte has the look of a distance fight. Both men have a good chin and even in the loss to Joshua Whyte took a lot of power punches before he finally fell. No way does Parker hit as hard as Joshua does. Look for an intense fight, maybe a mostly technical one, but not a fight that ends around the mid-way mark as Parker has predicted. It’s a good match-up, a 50/50 match-up and a draw cannot be ruled out. This one will be close.